How would we know a good defence strategy if we saw one? The Asian Century is challenging many of the traditional assumptions at the heart of Australian defence policy and strategy. Defence scholars have risen to the challenge of these transformational times and have collectively produced a smorgasbord of alternatives for policy-makers. The problem is that these recommendations all point in very different directions. How should we evaluate these options? Adam Lockyer tackles this question and develops a novel conceptual framework for evaluating defence strategies. By doing so, this book breaks new theoretical ground and makes an important contribution to our understanding of strategy in general and defence strategy in particular. 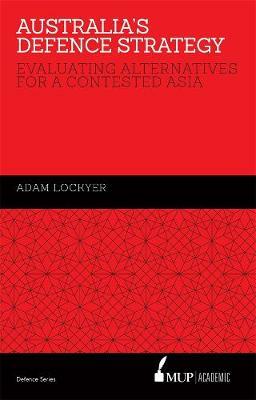 Lockyer then applies this analytical tool to the leading arguments in Australia's defence debate and finds that there is still substantial work to be done. Lockyer concludes by proposing a new Australian defence strategy for a contested Asia that would pass the test for a 'good' defence strategy. The result is essential reading for anyone interested in strategy or the future of Australian defence policy.